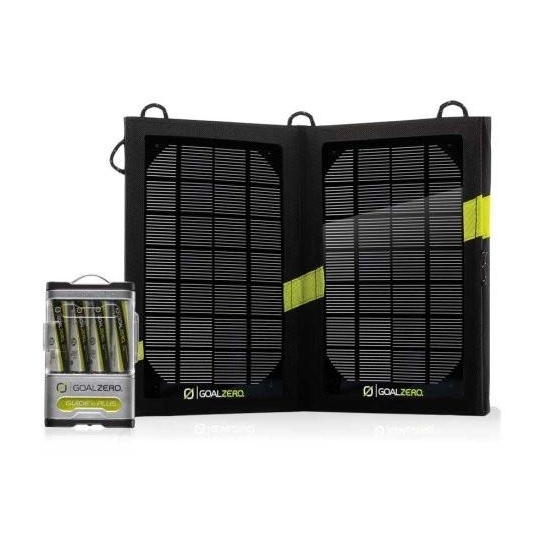 Goal Zero Guide 10 Plus Solar Recharging Kit included Nomad 7m v2 Solar Panel and Guide 10 Plus power pack. This ultra-lightweight kit is perfect for your handheld, USB powered devices. Go anywhere, with this rechargeable battery pack to keep your handheld gear going strong. Charge AA/AAA batteries from the sun or any USB port, then power your phone, MP3, GPS, or perk up your tablet in a pinch.